Our blank canvas wedding venue in Dallas has great bones with a white brick interior, exposed ceilings and concrete floors. If this sounds like your style than check out out our guide to the nuts and bolts of planning an industrial-chic wedding. Embrace an industrial edge by layering mixed metals, concrete, iron and wood to create a dynamic design. Skip the Chiavari chairs, which are far too traditional for an industrial wedding design, and upgrade to retro-inspired metal chairs. It’s a simple swap that will make a big difference. Mix different types of lighting from string lights with Edison bulbs to marquee letters. Oversized marquee letters are both simple and graphic, the ideal combination for an industrial design element. 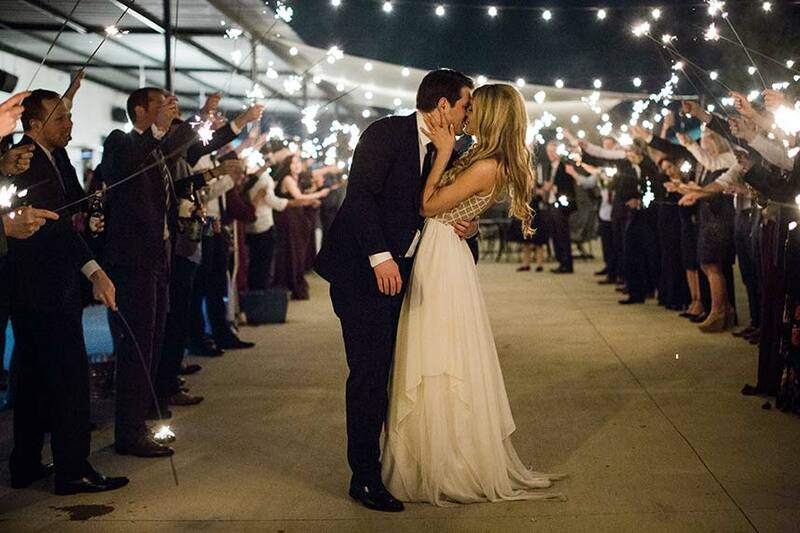 Use strings of bulbs as a ceremony backdrop or as lighting over your reception tables. Have them hang low so guests don’t feel to small in such a large space. Skip flowers altogether and instead make a statement with graphic signage and moody candlelight. Keep your reception tables uncluttered with simple candles in monochromatic tones and minimal greenery. Set your table with concrete elements for an instant dose of industrial style. Concrete dinnerware and candle holders—need we say more? Fall is here, which means another jam-packed wedding season is upon us, in preparation for the upcoming season at our downtown Dallas venue, we’re sharing the best fall wedding trends for 2018. Balloons are no longer just for birthday parties, they are making the leap to wedding decor for fall 2018. The end result looks stylish and whimsical that will wow any wedding guest. Balloons are an easy way to make a blank canvas venue really pop. Expect to see clusters of colorful balloons used as oversized wedding arches, backdrop walls, decorative columns and even table runners. Since Millennial Pink has become the go-to hue, engaged couples who are looking for ways to make their wedding stand out are putting a new twist on a typical fall color–orange. Using bold, almost fluorescent orange can create a statement if used sparingly. Add bursts of this colors in a sea of greenery and driftwood for a unexpected and beautiful fall wedding. Fashion-forward grooms take note. Menswear is also getting a stylish update this season as burgundy replaces navy blue as the top color for suits. This rich hue pairs effortlessly with that statement orange we mentioned earlier. Take your linens to the next level a luxurious fabric like velvet. 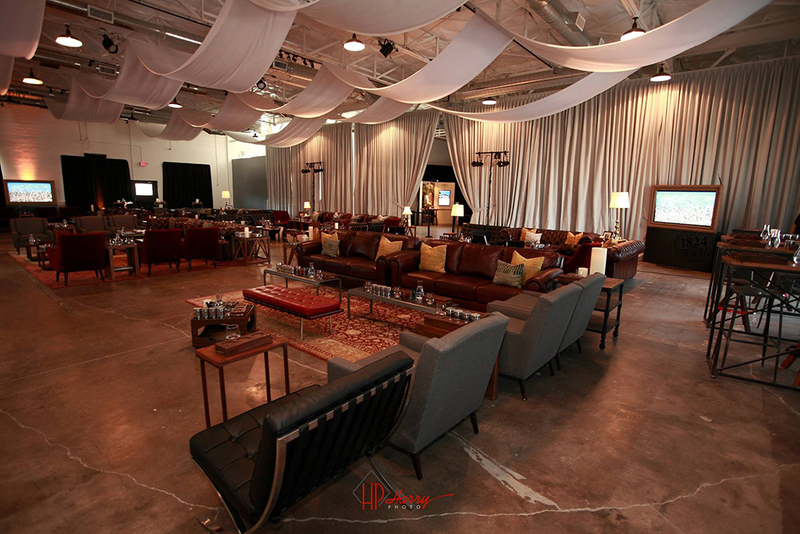 Our event venue in Dallas hosts all sorts of events, not just weddings. 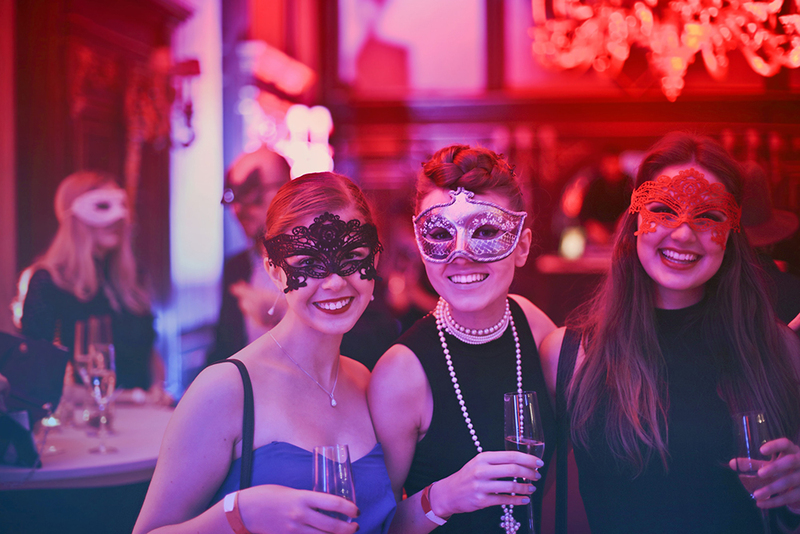 If you’ve always dreamed of planning a Masquerade Ball for a Halloween or New Years Eve party then check out our tips for unforgettable party. 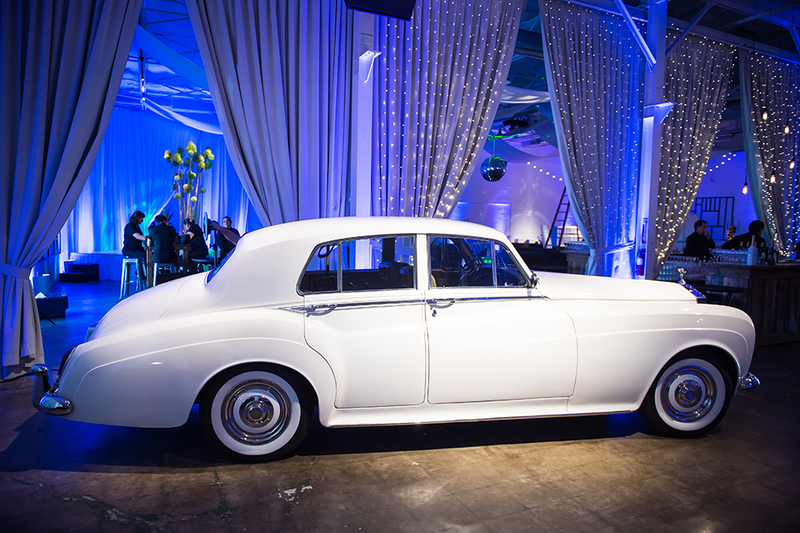 The first step to planning the decor for your event is to choose the tone of the event. Is it formal or casual? Knowing the tone of the event will help you choose a color palette. For a more formal affair stick to a more neutral palette like white, black and silver. Once you know your palette set the mood with colored lighting and tall colored candles in metallic candelabras. Impress your guests by hiring a string quartet for the whole evening or to play as guests arrive. Then when everyone arrives welcome them with a formal greeting before commencing with dinner and a dance party. Asks your guests in the invitation to wear a mask to the event to add to the mystery and drama of the evening. During dinner consider having a short play or murder mystery where everyone has clues at their seat and they have to guess who the murderer was and what the weapon was. 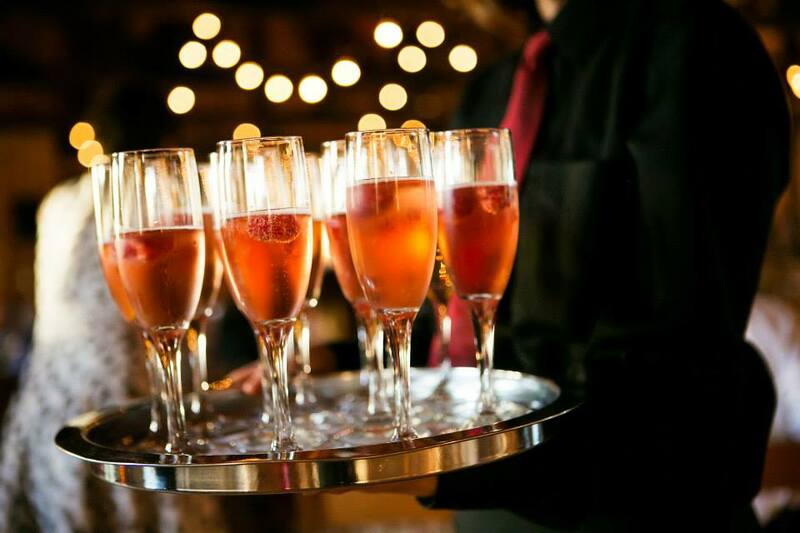 When planning a fall party at our event venue in Dallas, one of the most important aspects for guests is a good drink. We asked our friends at Gil’s Elegant Catering for some crisp cocktails for your guests to sip at your fall party. Check out our list and tell us which ones you would incorporate at your event. This pear margarita is the perfect stiff drink, except that it doesn’t taste strong thanks to the honey. For a subtle but wonderful touch, garnish with a sprig of rosemary and line the rim with cinnamon. Skip dessert and have this cocktail instead. Smooth, creamy, sweet and rich with nuances of pumpkin and cinnamon. It’s basically boozy pumpkin pie in a chilled glass. The sweet and juicy taste of plums mixed with the unique flavors of thyme and sparkling wine make these cocktail light and refreshing. Warm up on cool fall nights with a classic hot toddy infused with apple cider. The perfect blend for your fall festivities. Try this delicious fall twist on the Moscow mule with sparkling apple cider and a generous splash of cranberry. The the whole ginger-apple-cranberry combo is a quintessential seasonal flavor. 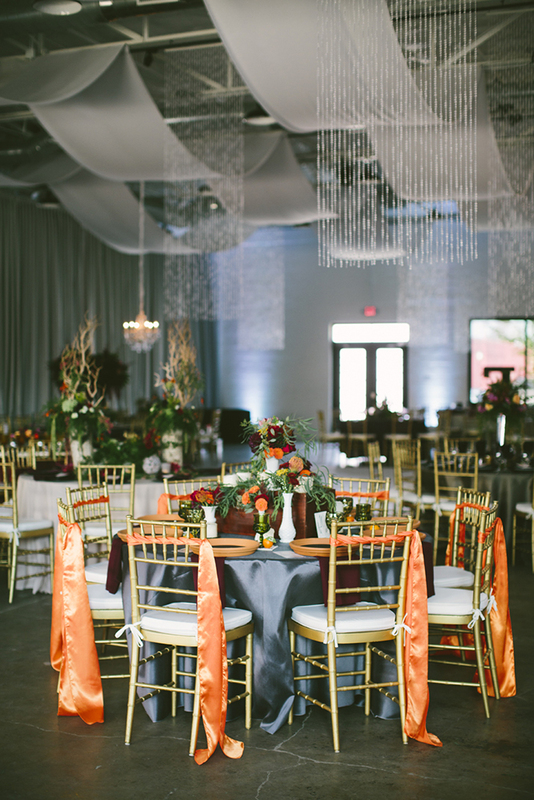 When deciding your fall Dallas venue think about how your decor will look in the space. Autumn gives you the opportunity to embrace cozy decor elements. If you’re feeling uninspired, check out some of our favorite fall wedding ideas for 2018. Give your reception a whimsical feeling with unexpected fall florals. Cotton is versatile fall classic. It takes up a lot of space which makes it a good value in your arrangements and won’t wilt. Pair it with dried yellow craspedias, tallow berries, phalaris grass, wheat, and sola-wood roses. During autumn many people start using their fire places to cozy up next to with their special someone. Give your your wedding that same warmth and intimacy with a cozy lounge experience at the reception. Use lots of sofas, rugs, and candlelight to set the tone of the evening. A signature cocktail is always a fun addition to your reception and nothing says fall like a nice cup of cider. Serve it with a cinnamon stick and add rosemary as a garnish to elevate this classic drink. Box up mini-pies as favors to send home with your guest. After all pies are the quintessential fall dessert, why not at your wedding too. Add a personal touch by placing a special note inside. 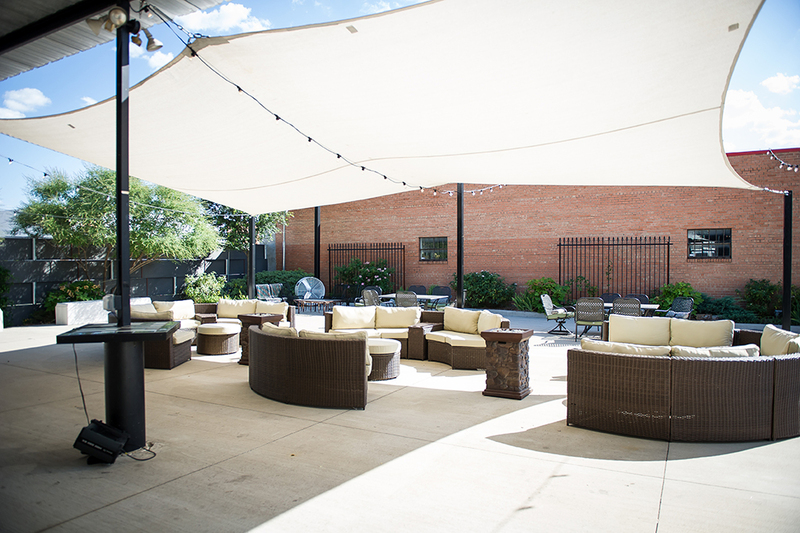 At Empire, you can always find the latest DFW wedding venue trends. One trend we can’t get enough of is Millennial Pink. Tonal color palettes composed of coral, blush, rose and pops of rose gold have us feeling inspired. So we created a list of trendy wedding details that feature Millennial Pink. From announcements to thank you notes, your color palette is the essential element that ties your theme together. In the same way your stationery sets the tone of the wedding for your guests, consider bringing in those pink details in a sophisticated way with foil-pressed cards written in a modern script on a soft blush paper. Your pink tones don’t have to just come from the flower arrangements when it comes to setting up tables. Clear acrylic table cards with white lettering show off your colors without over-doing it. Be sure to consider your place settings too. A white plate with a blush or coral placemat would look amazing with some texture from white velvet napkins or a pink petal runner. Custom cocktails are always a crowd favorite. Play to your theme with pink flavors like raspberry and strawberry. Serve them in rose-gold rimmed glasses for pink perfection. Once you book the downtown Dallas wedding venue of your dreams, the next step is to start planning your décor. Our blank canvas venue offers an endless array of styling options so that you can transform it in to reflect your unique, individual personalities. We’ve seen couples create modern, traditional and high-fashion events here with the city as their backdrop. You may feel overwhelmed by all these options, so we’ve highlighted some different ways you can style your blank canvas. There’s no need for elaborate decor when your venue boasts big picture windows with city views and an outdoor patio area perfect for food trucks, photo booths and mingling. Imagine a ceremony with awe-inspiring views of the city. A few suspended string lighting across the patio for a bit of ambiance and an arch to say your vows under can go a long way. Consider tall florals that remind viewers of the openness of the space. There’s so much you can do with 7,500 square feet of white brick, tall exposed ceilings and concrete floors. It’s the perfect canvas for the white city wedding you’ve always dreamed of. You can achieve this subtle look with some soft white linens and cascading greenery. Adding accents like acrylic chairs and tall glass candle holders make for a luxurious city combo. 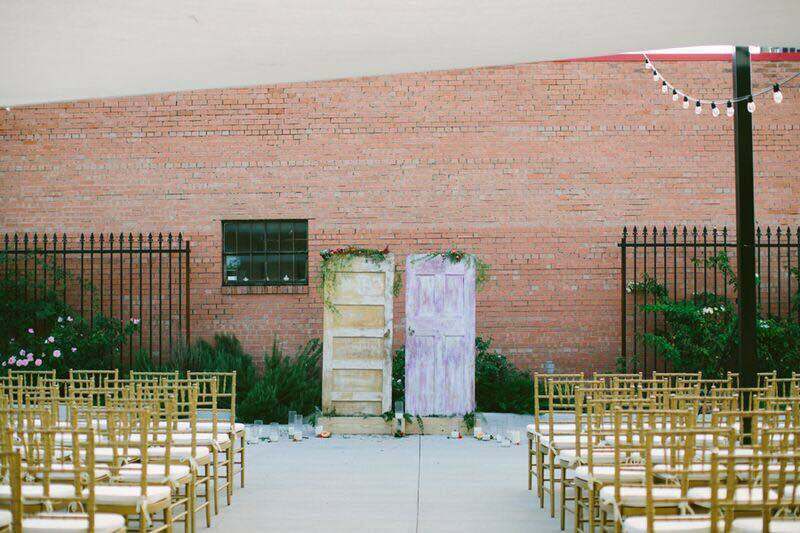 While our venue is great for minimalist weddings, it’s also great for more formal affairs. Our gilded chairs provide instant glamour for a sophisticated city wedding. To bring out the most elegant features of our venue decorate with glittering chandeliers hung from our high ceilings, use towering floral centerpieces and a classic color palette. When searching for event venues in Dallas you should also consider your transporation for your grand exit. We’ve seen some amazing send offs at our venue and rounded up some creative picture-perfect transit ideas. Vintage cars are so unique and perfect for an exit unique to you as a couple. There’s so many options from a Rolls-Royce to a brightly colored Volkswagen Beetle covered in balloons. If you’re an adventurous couple or have always had an affinity for motorcycles then why not make an exit on one. Alternately you could make a get away on a motorbike with a buggy or a Vespa. 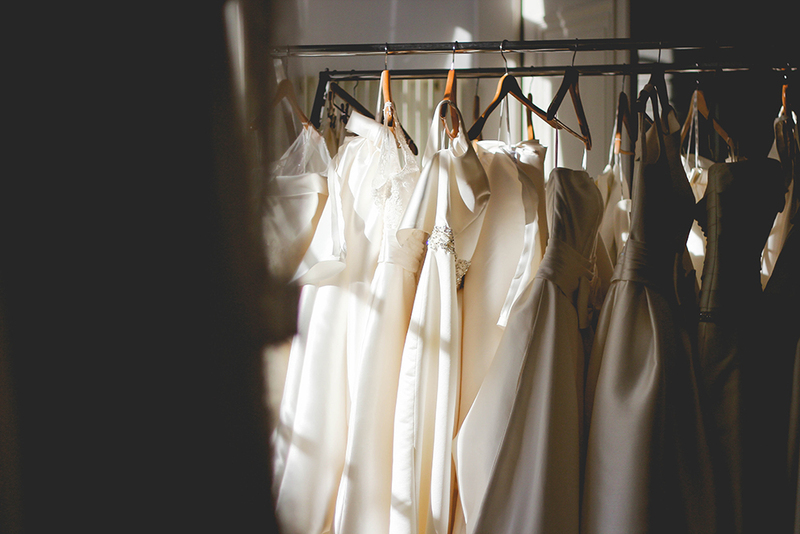 The bride will look gorgeous with her veil and dress flowing in the wind. Who said you had to make an exit in a car? You can create a romantic exit in a horse-drawn carriage. It’s the perfect ending to a fairytale wedding day and will make for some great photos as you ride off through the city. Looking for an chic and edgy ride? Consider renting your dream sports car for the day. Speeding off to your happily ever after makes for ultra cool escape. Plus it gets you to that honeymoon you’ve been dreaming of that much quicker.